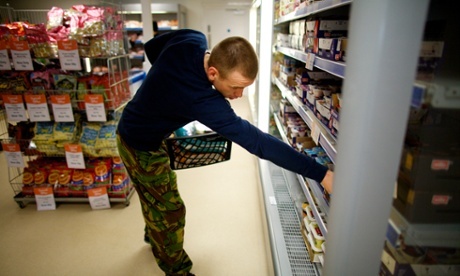 The UK’s first full-scale social supermarket starts its national rollout on Monday, selling surplus food and drink to people on the verge of food poverty for up to 70% less than high street prices. The first Community Shop, in West Norwood, south London, is backed by the mayor, Boris Johnson, and Rosie Boycott, chair of the London Food Board, which helped find its premises. Its launch – with a further 20 in the pipeline across the UK – follows the success of a pilot scheme in Goldthorpe, near Barnsley, South Yorkshire. The model was highlighted in a report last week by an all-party parliamentary inquiry as one that should be developed to “make a real and positive difference to people’s living standards”. Community Shop will work on a membership basis, each involving 750 members all living locally and on income support. Members can shop for surplus food from leading supermarkets and brands including Marks & Spencer, Asda, Tesco, Morrisons, the Co-operative, Ocado, Innocent, Brake Brothers, Nestlé and Müller. It is estimated that around 3.5m tonnes of food is wasted each year in the UK before it reaches shopping baskets, of which about 10% is good enough to be eaten but is rejected because of damaged packaging or mislabelling. Community Shop is a subsidiary of Company Shop, a commercial redistributor of surplus food and goods.